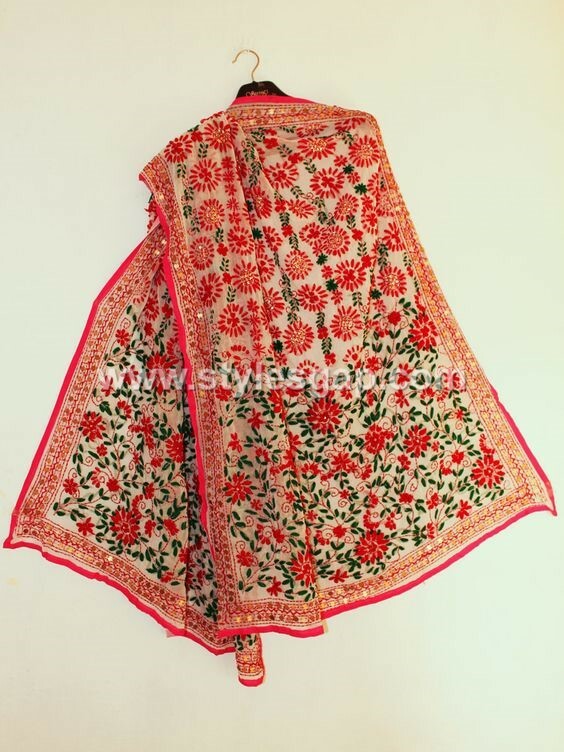 Eastern embroideries are the emblem of its rich cultural heritage. 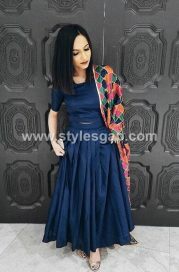 As we are walking more towards the fashion revolution, the craving to reach out to our roots and foundation are becoming more evident. 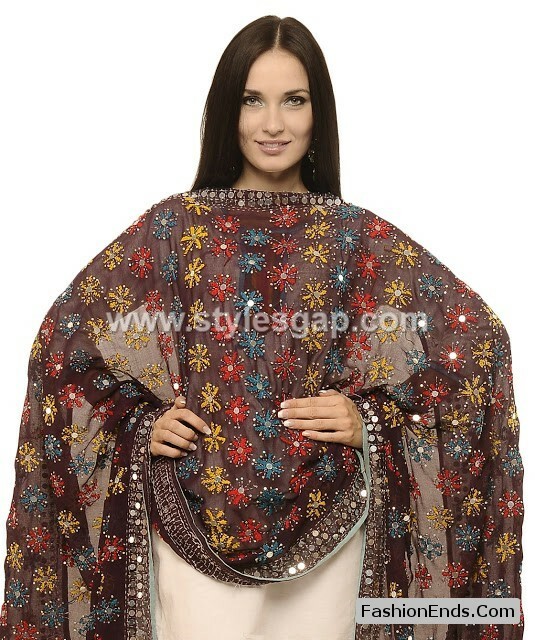 Infusion of traditional embroideries into our dresses or attire makes it extremely exotic and exquisite in its style. 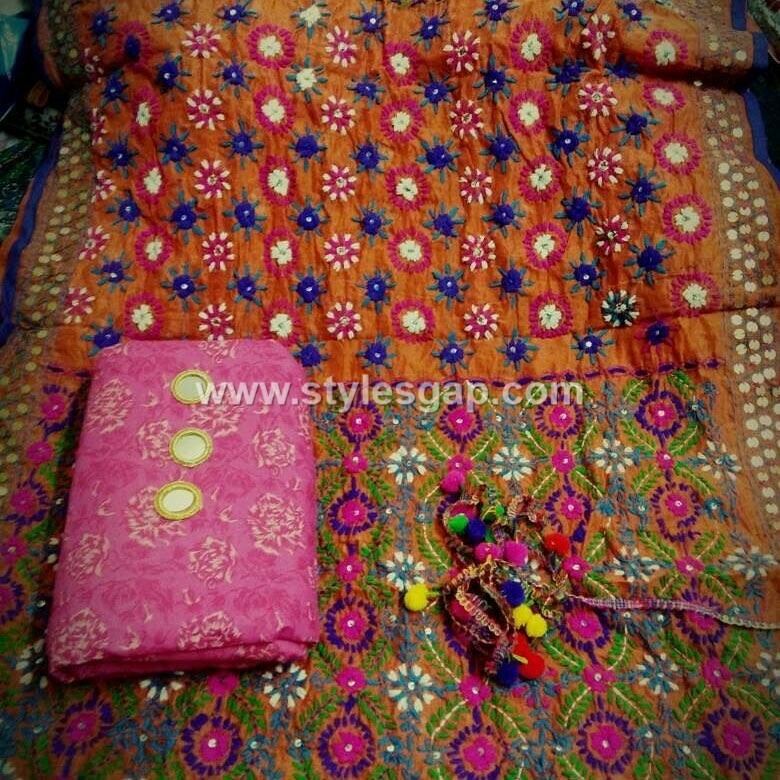 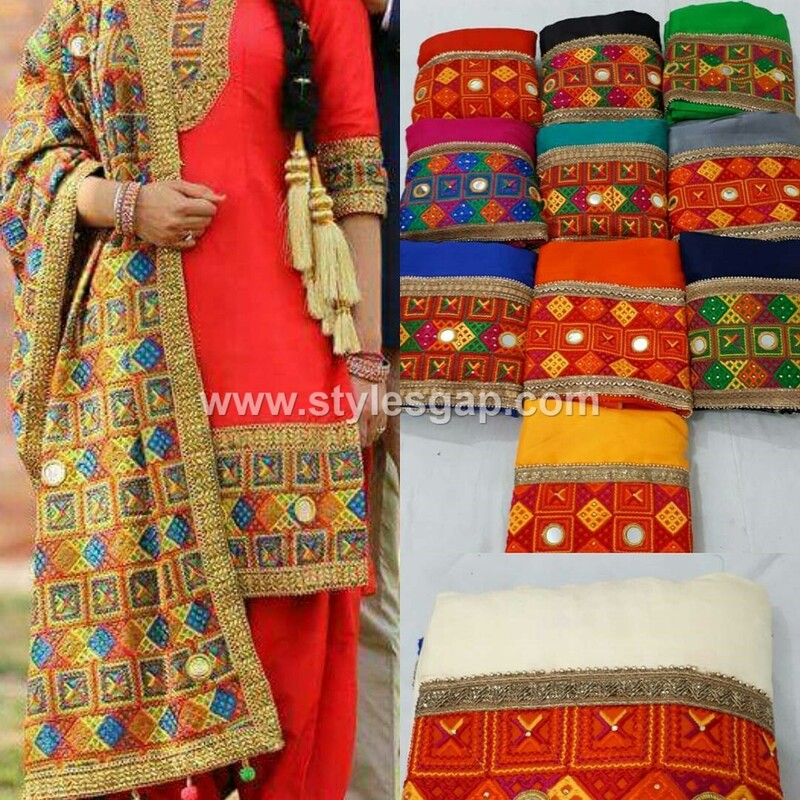 Phulkari, per say, is one of the finest work of art done in most parts of Pakistan. Phulkari shawls and dupattas are especially popular in the region for the diversity of colours used and detailed Floss silk work in intricate patterns. 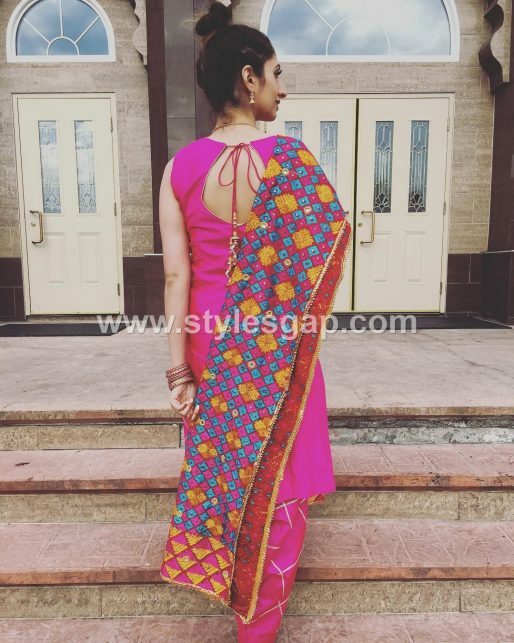 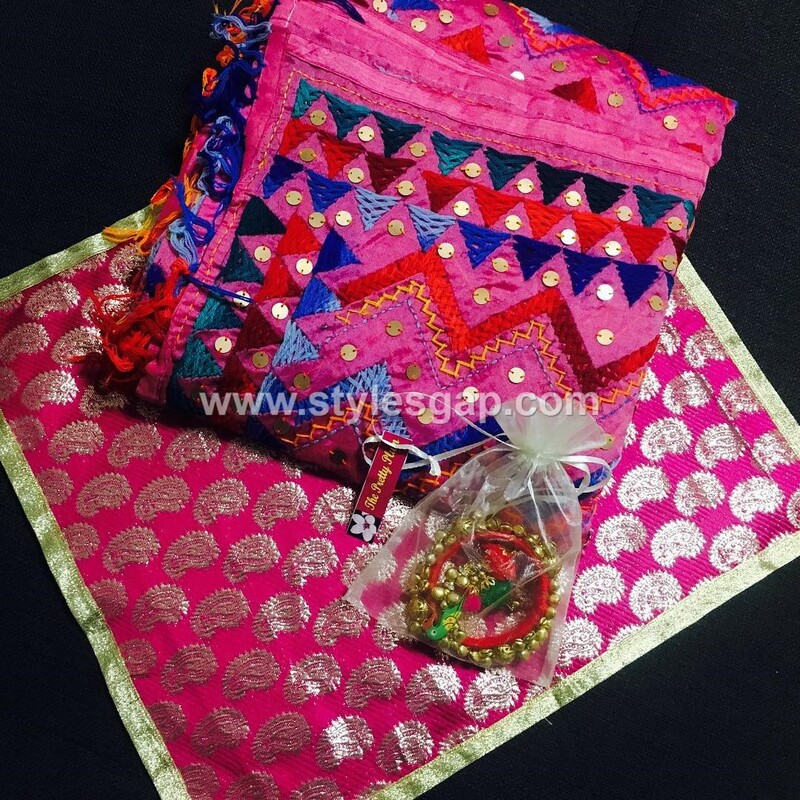 Phulkari means “Flower work” which was used to glorify the bridal couture of ancient times in India, but now it is more of a fashion statement which is turning into the latest trend. Now it’s not just the shawls, but the trousers, tops and jackets are also much in demand. 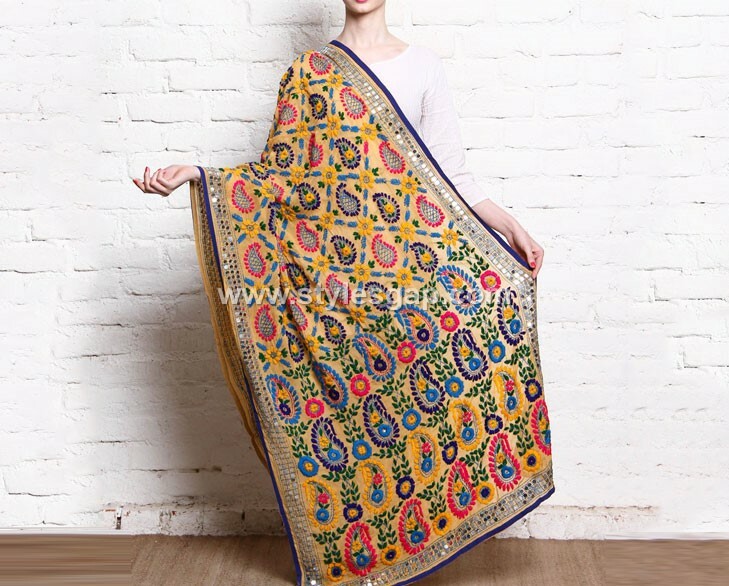 The beauty of this particular style is so tempting that even simple dresses are printed with special phulkari designs to amplify their outlook. 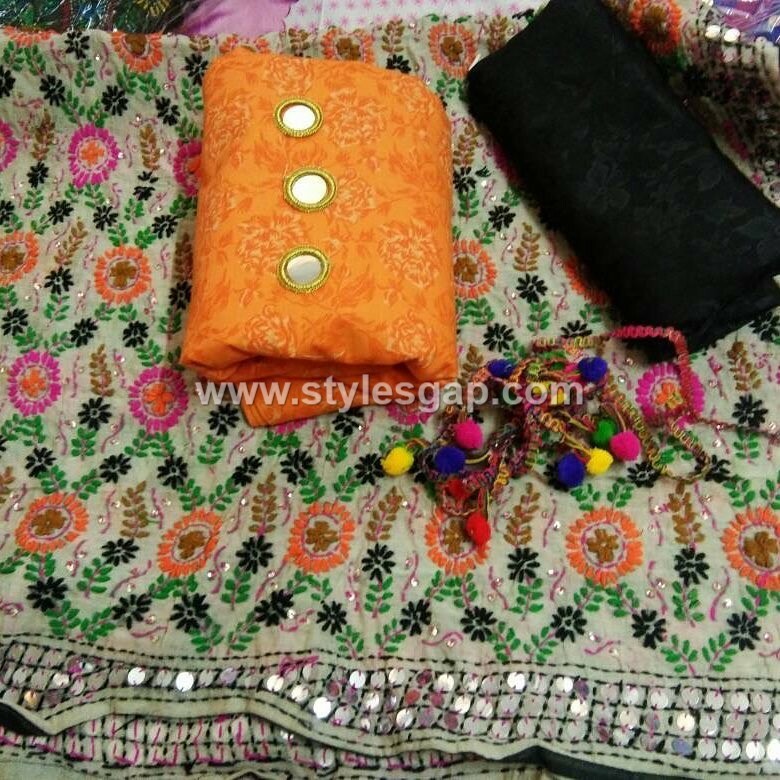 We are going to share Latest Phulkari Dress Designs Collection. What new designs and styles are brought forth regarding the Phulkari trend this year is still left to find out? 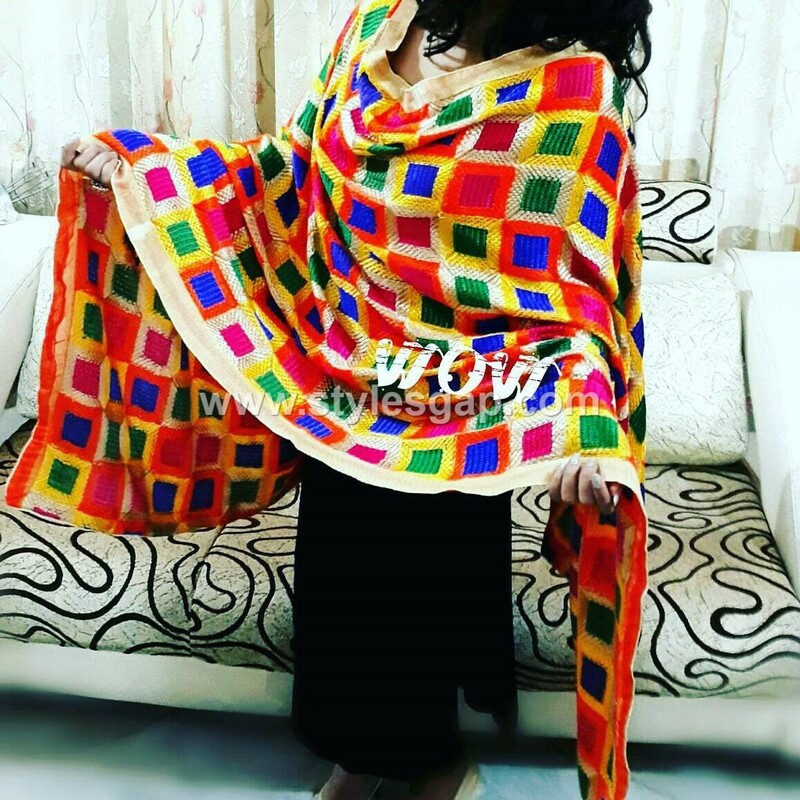 So scroll hard and get the latest insight of upcoming hits of Latest Phulkari Dress Designs Collection including phulkari shawls, dupatta, trousers, shirts and trousers. 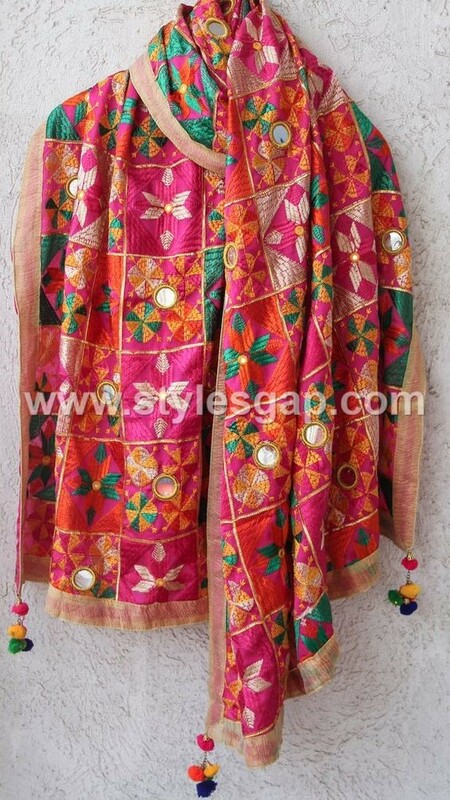 This one is not new to many, has ever been loved ardently in every season. 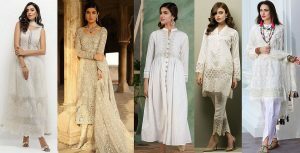 Plain dresses in white or black are paired with richly embroidered phulkari shawls to spark a lovely mesmerizing display of colors. 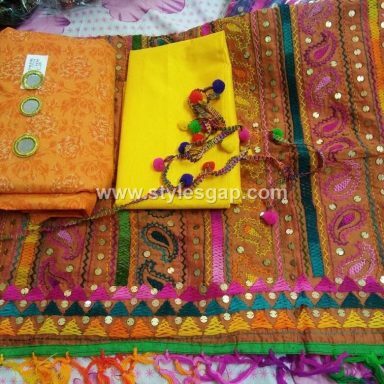 A number of hues are paired in embroideries to create a set off combination, like tones of yellow, blues or red. 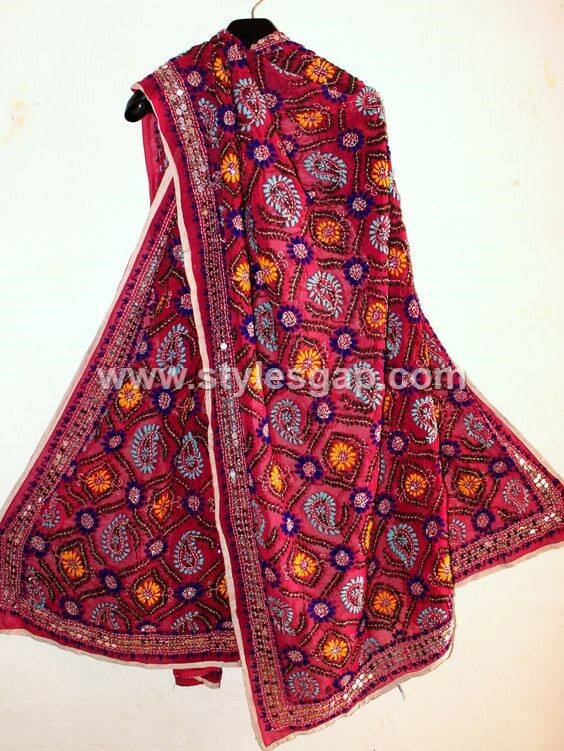 For fancier shawls, specialised phulkari work is crafted using beads or shimmering thread work. 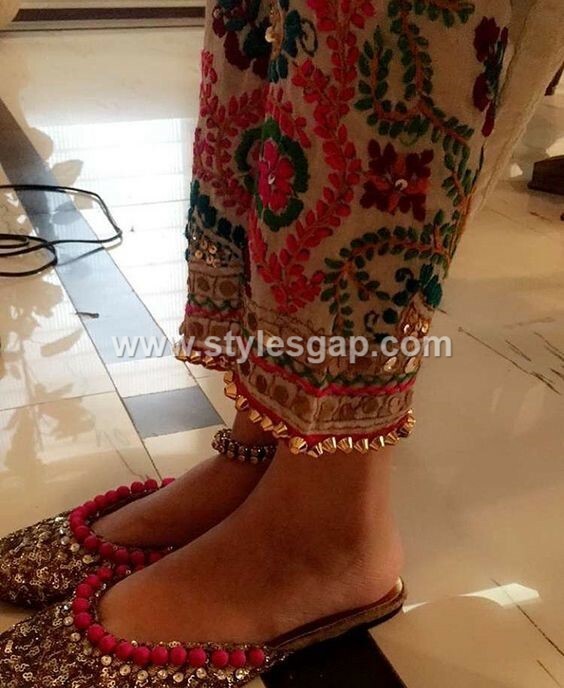 You can try these with matching shalwar kameez, kurta pants or any other attire of your choice, as these look equally ravishing with each. 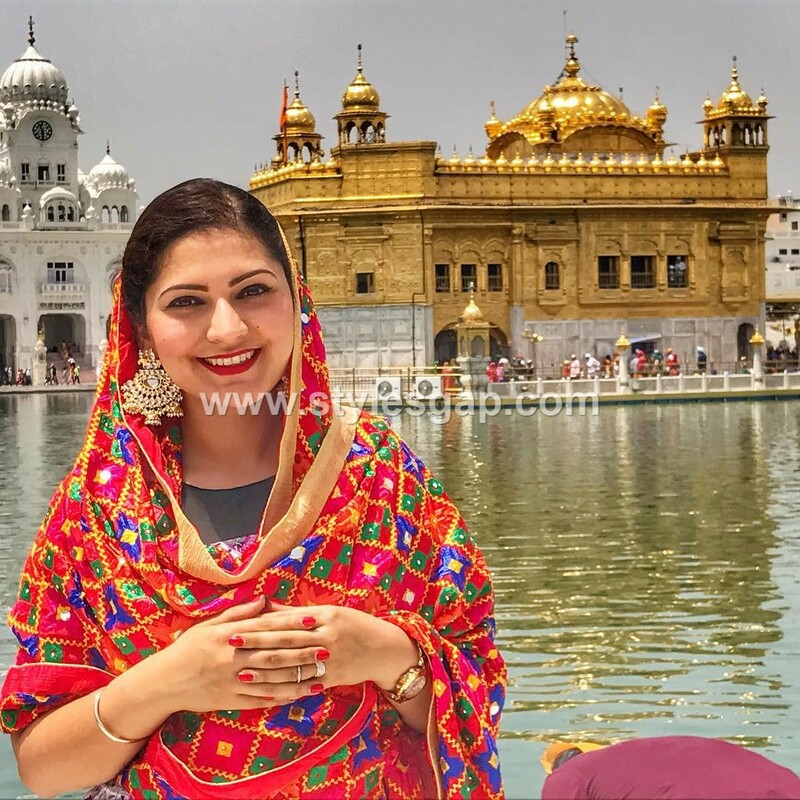 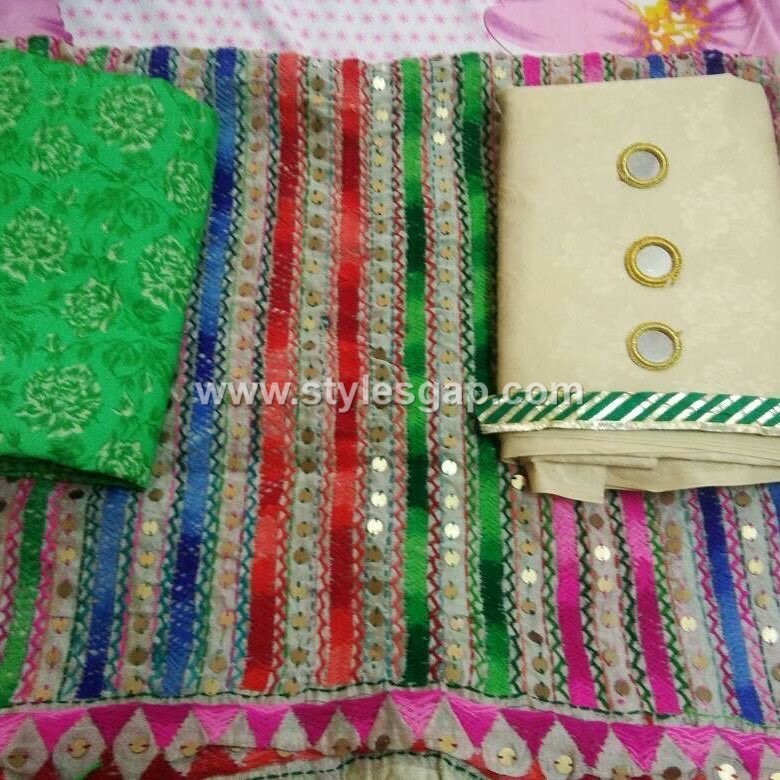 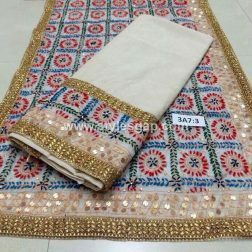 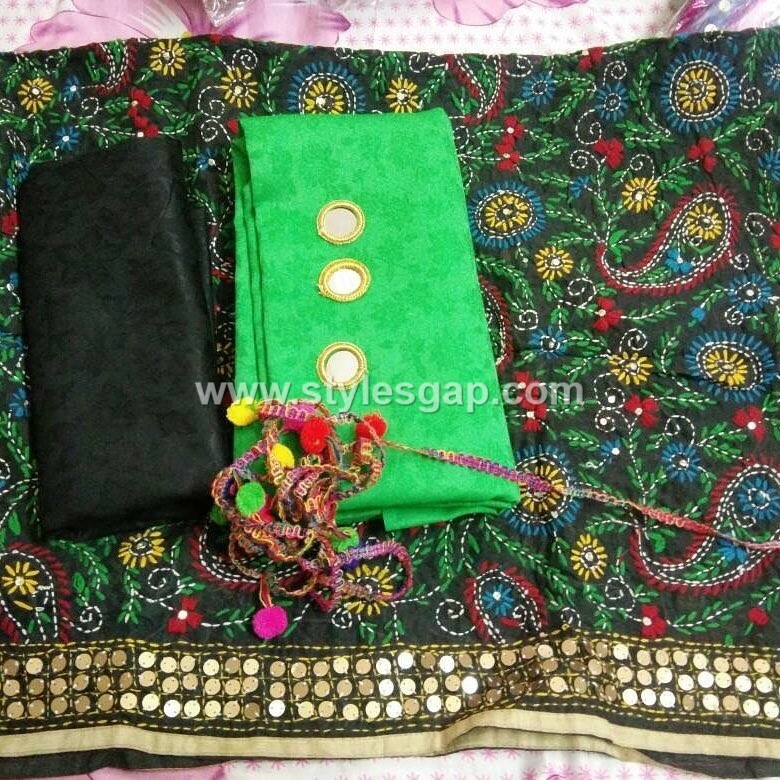 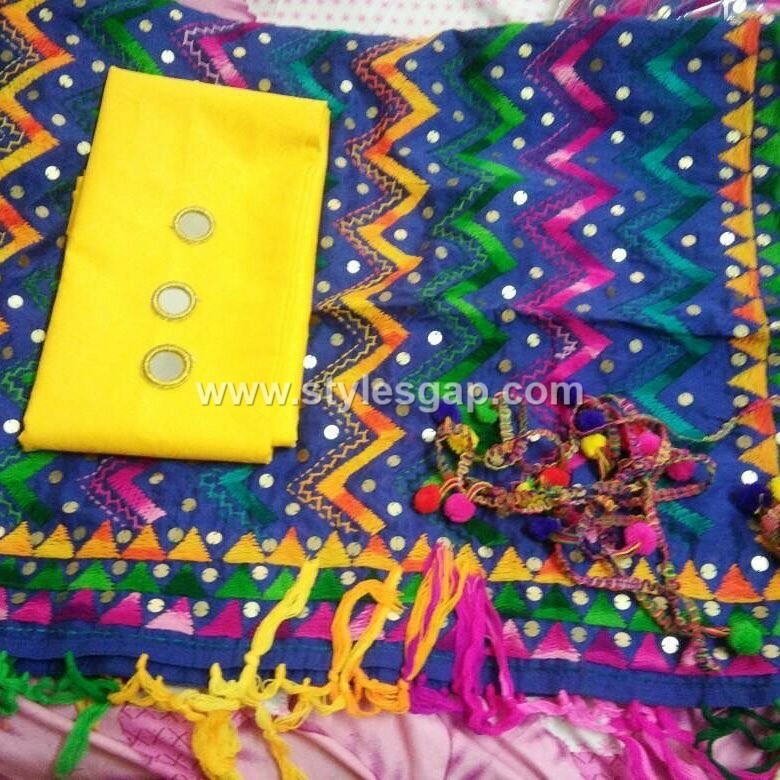 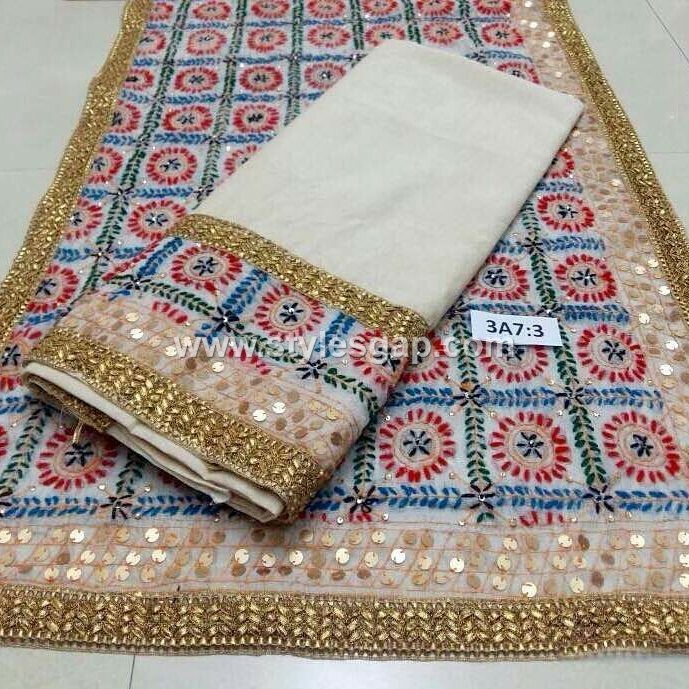 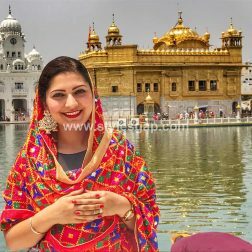 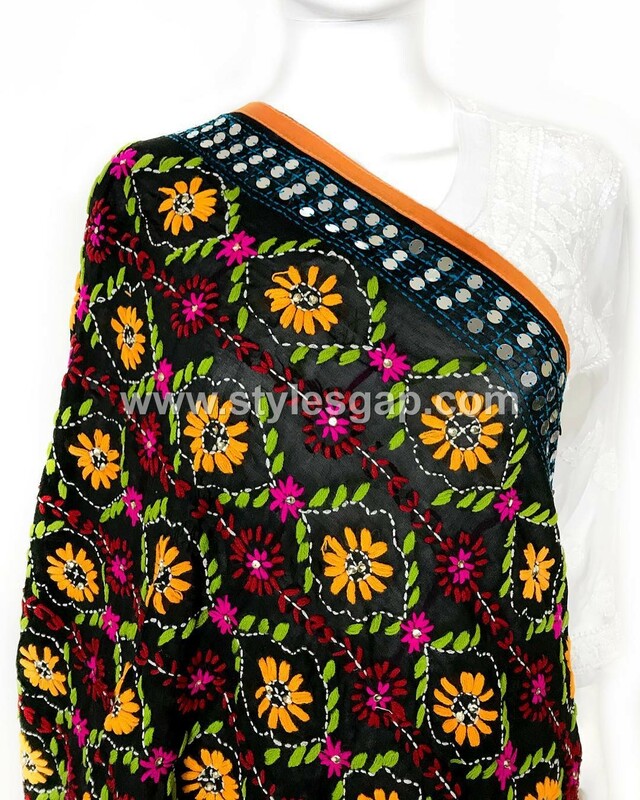 For summers, where you can’t go for heavy phulkari shawls, and you need to carry something light and easy, well you can get yourself pretty colourful embroidered dupattas, which are embroidered using the same work but on chiffon or georgette dupattas. Basic black or white is used which are then embellished with colourful work all over. 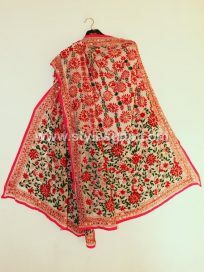 Floral patterns in traditional style are crafted all over while the borders are lined with special work. Another emerging trend is to alter the heavy embroideries with the printed phulkari prints in chiffon. 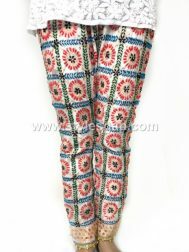 These give the same effect and outlook, except these are more comfy to carry anywhere and serves best for casual wears. You might not wear a heavily embroidered shirt in phulkari, but a contrasting touch of a phulkari jacket will definitely inspire you to the core. 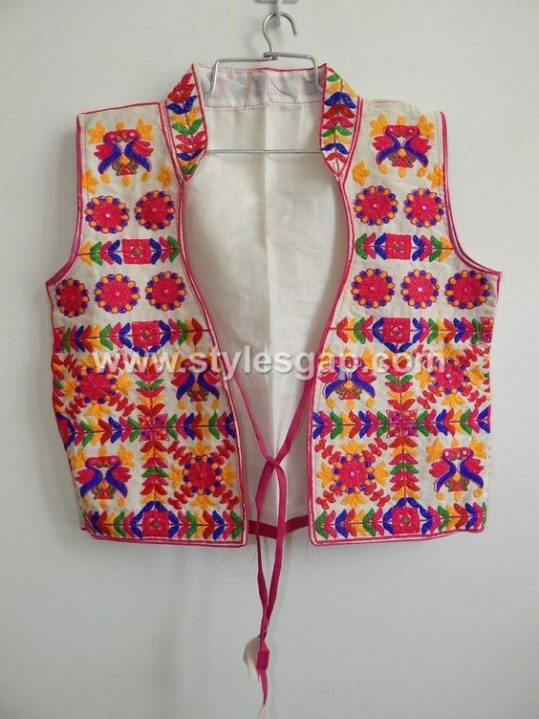 These are waist length sleeveless jackets which are intricately embellished with phulkari embroideries in the variety of colors. 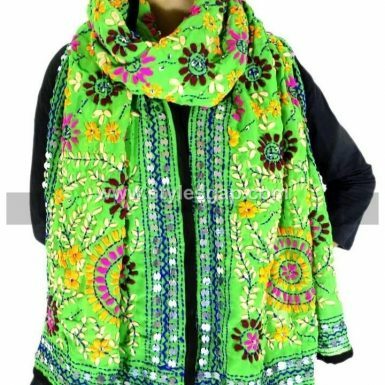 The jackets we have brought here are the ultimate delight, and you might have seen many like these worn by your favourite divas on various occasions or screen. 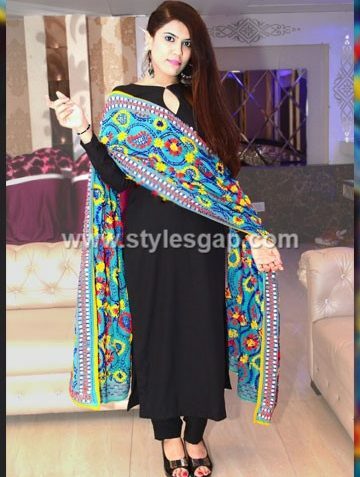 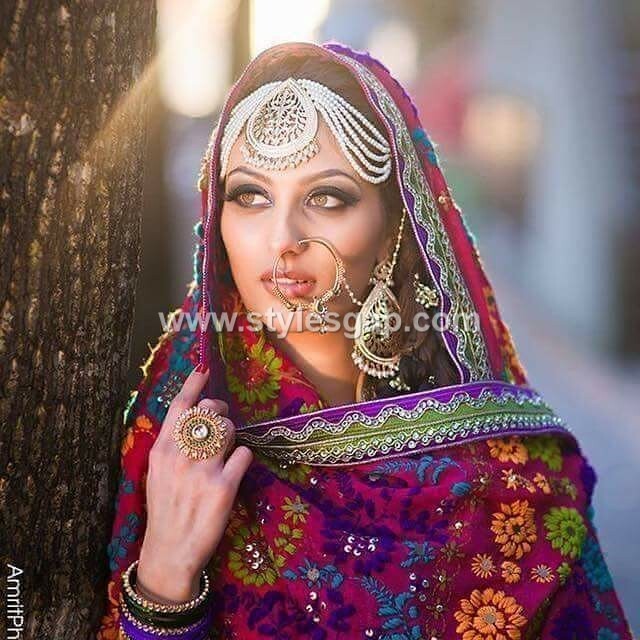 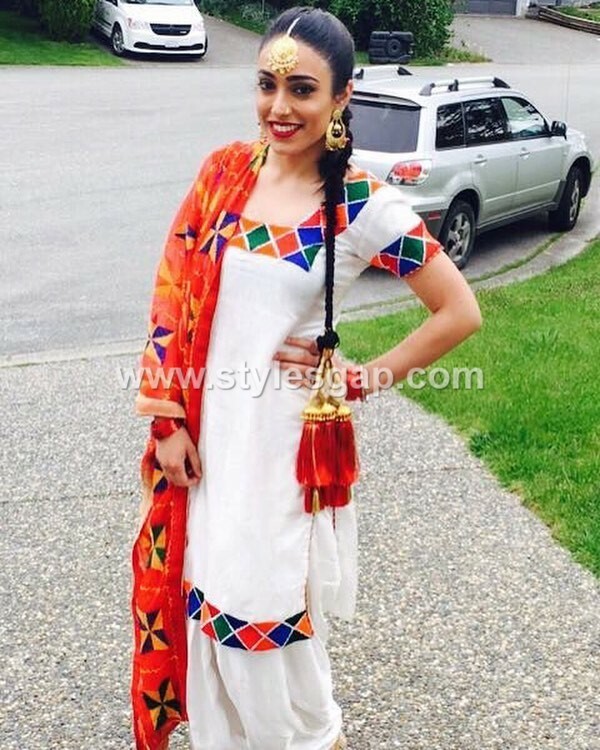 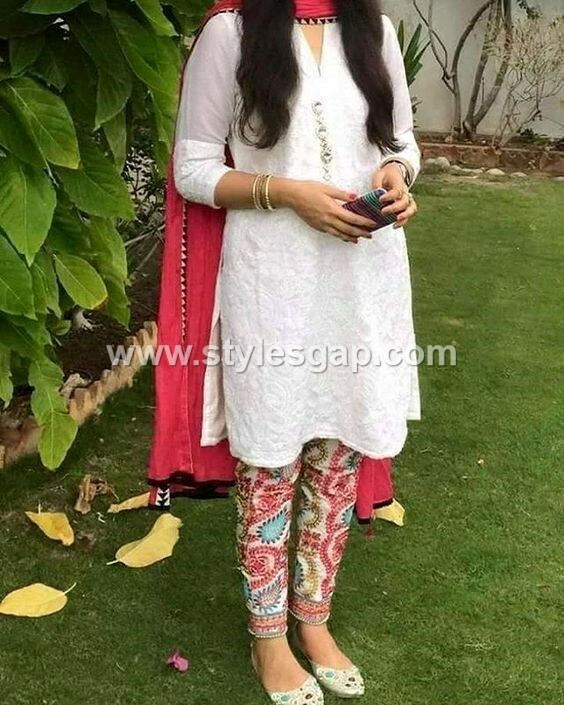 You can try these on almost every other attire, either its pant shirts, shalwar kameez, or tops with trouser, as long as Phulkari is on it, the jacket can complement any of your dress. 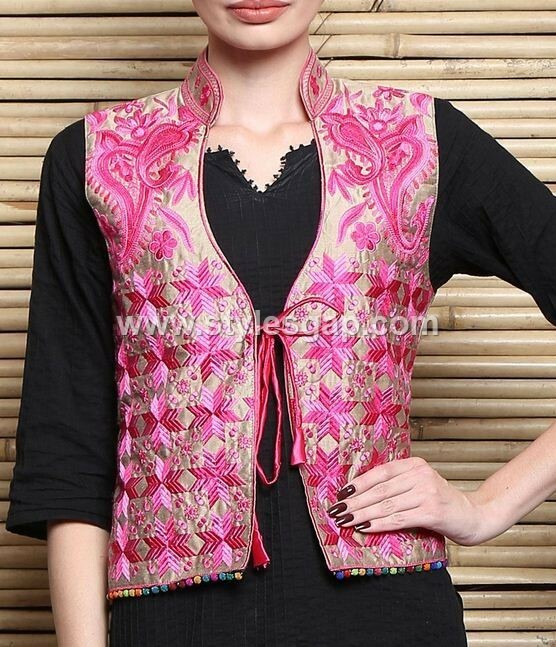 For a fancier touch to these jackets, you can use shiny silk threads in the embroideries. 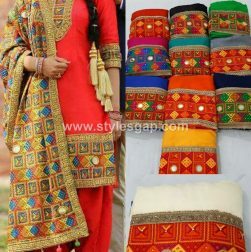 Use of uplifting colours is a must to for these. 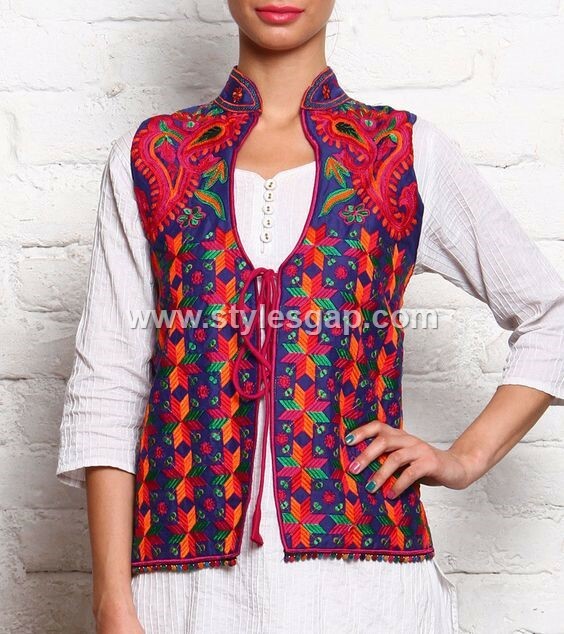 The trend we all have been anticipating for is nowhere to amuse you with all the mesmerizing hues. 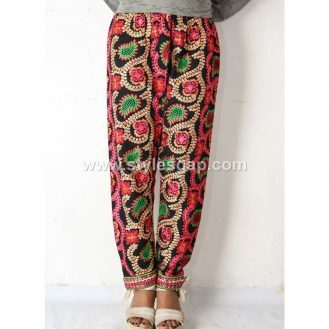 Phulkari trousers or pants are to dazzle you up with the charming display of its twisted floral embroideries. 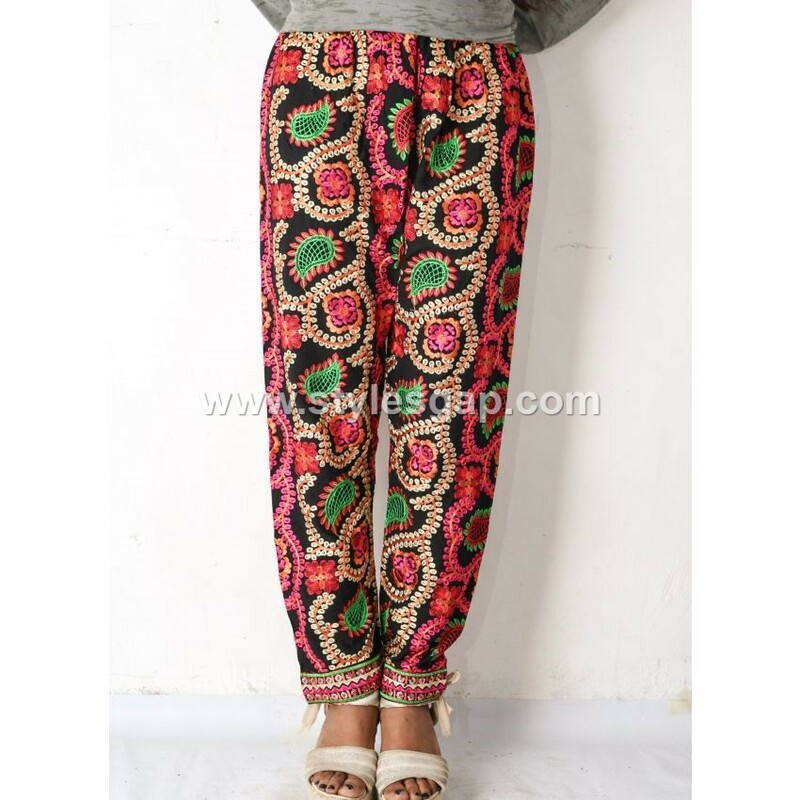 These adornments are not confined to the bottom but cover the entire plain of the trouser. 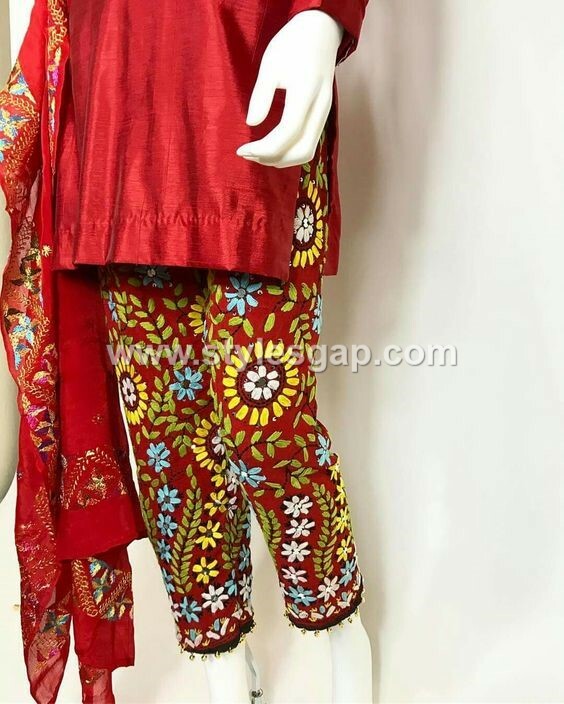 Have a look on the below-posted image gallery of wonder designs. 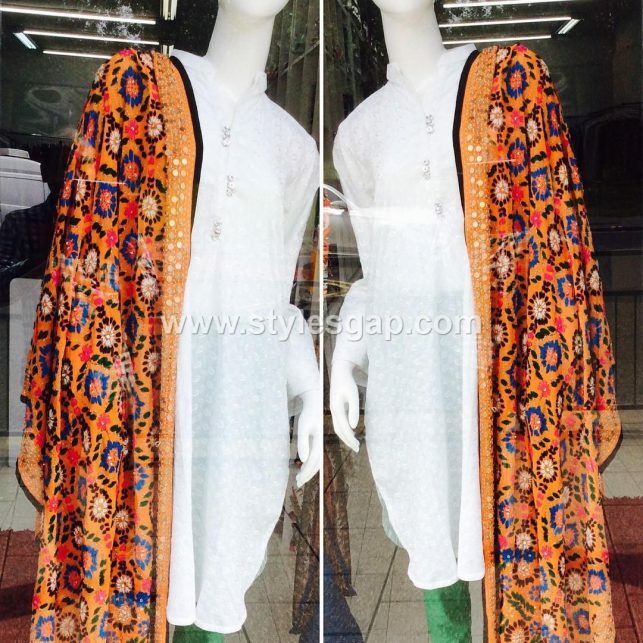 You can also design your favourite look out of them. 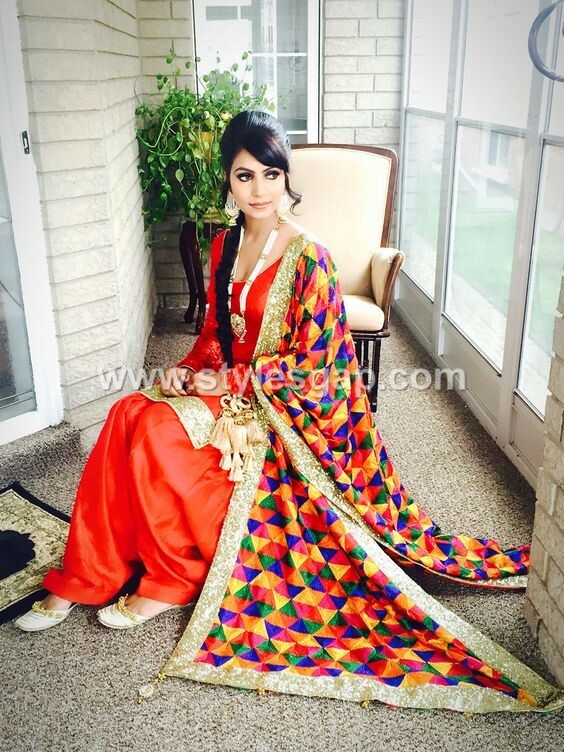 They are so colourful and best to wear for sangeet events, weddings, mehndi functions and much more. Hope you have loved viewing this beautiful and latest phulkari dress designs collection. 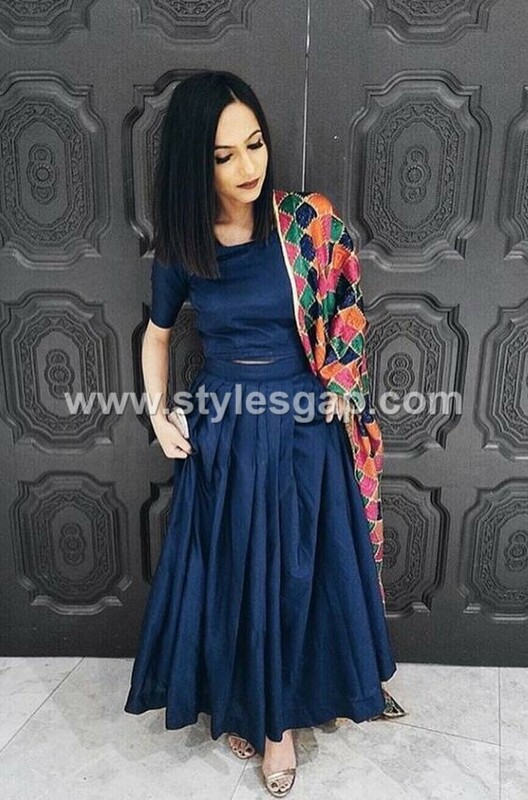 Keep following us and get updated with the latest fashion trends.